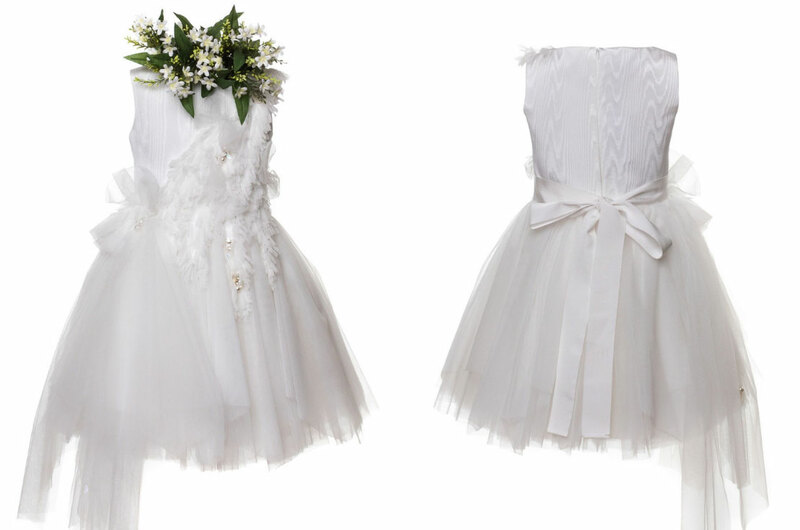 How to choose the perfect dress for you girls first holy communion? Here are 7 exclusive proposals of dresses that express charm, refinement and preciousness all of which are “Made in Italy”. 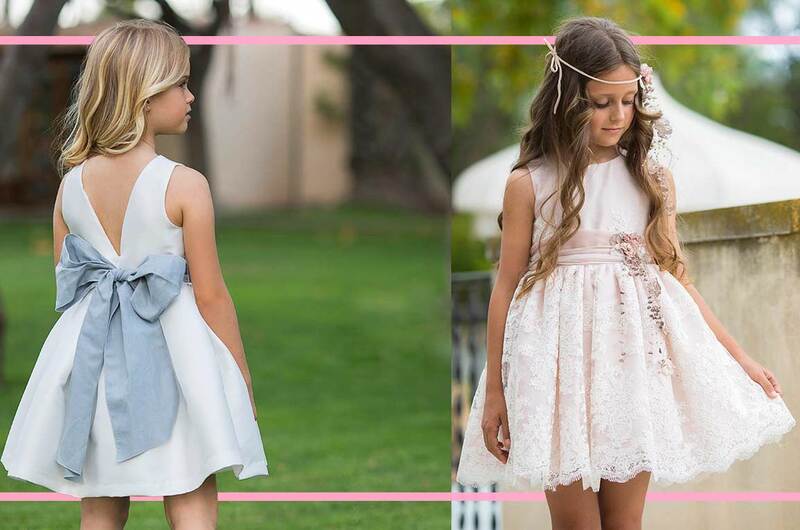 We begin our roundup of little girl dresses with an important recommendation: do not hesitate to contact us to request more information about our proposals. In many cases these are unique items with very limited availability. Do not risk losing these opportunities dedicated to ceremonies. 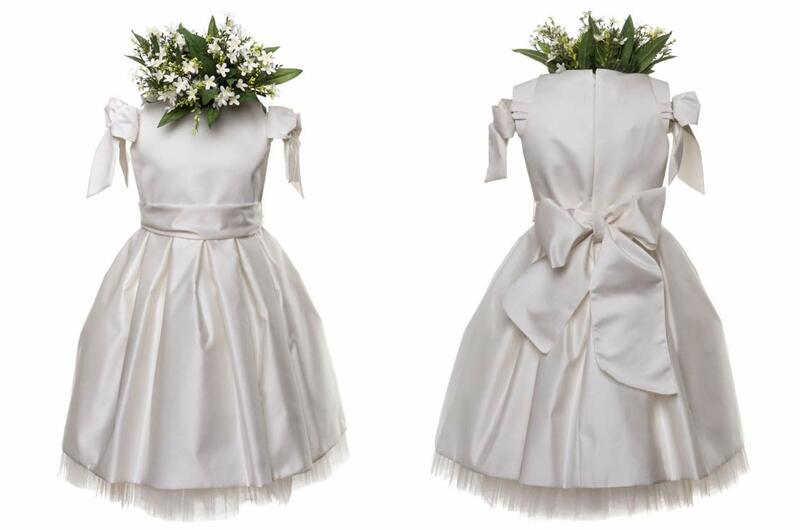 Let’s start with a cream mixed silk dress made of precious mikado fabric, very soft and extraordinarily shiny. It is a sober piece perfect for a paige girl or first communion. Sleeveless model with refined bows hugging shoulders, round neckline, wide loose pleated skirt that give volume. 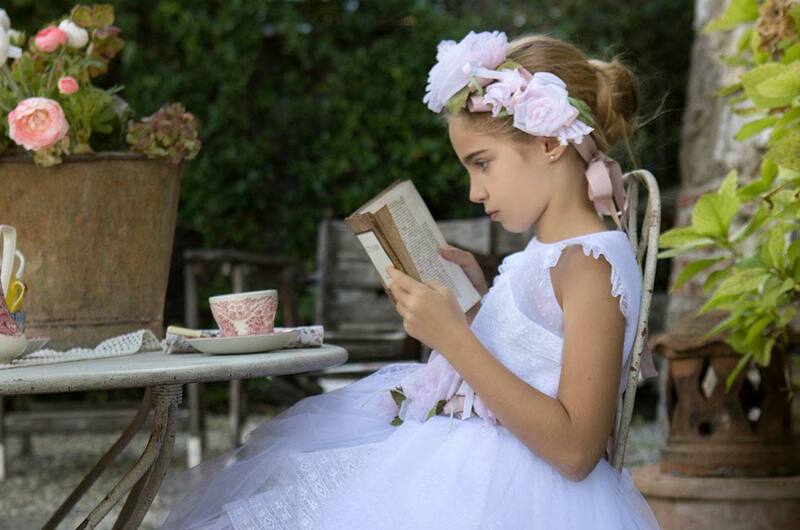 This precious Raffaella dress is currently only available in the 75 (9/10 years) and 85 (11/12 years) girls’ sizes. 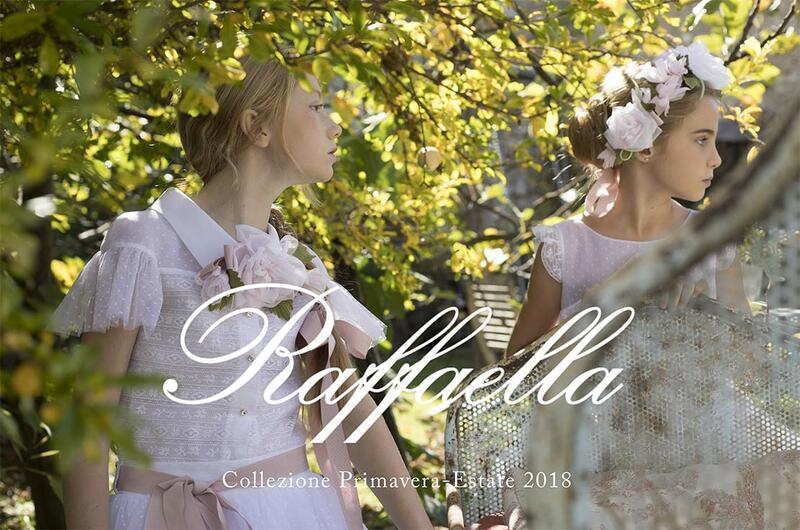 The Raffaella macramé embroidery is a guarantee of style and elegance Made in Italy; a marvellous example of sartorial mastery is this elegant white dress with precious embroidery made on a base of soft Swiss cotton organza. A romantic model, sleeveless with wide skirt, soft folds at the waist that give this piece the right volume. 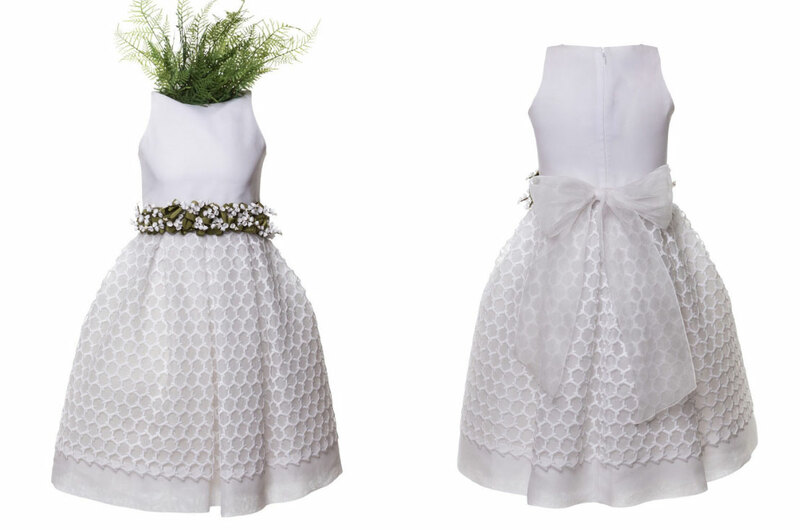 A belt with lilies of the valley with an organza bow on the back and the precious hexagonal macramé on the skirt make this garment very special. The Raffaella dress is currently available only in the girl size 80 (10/11 years) and 85 (11/12 years) . 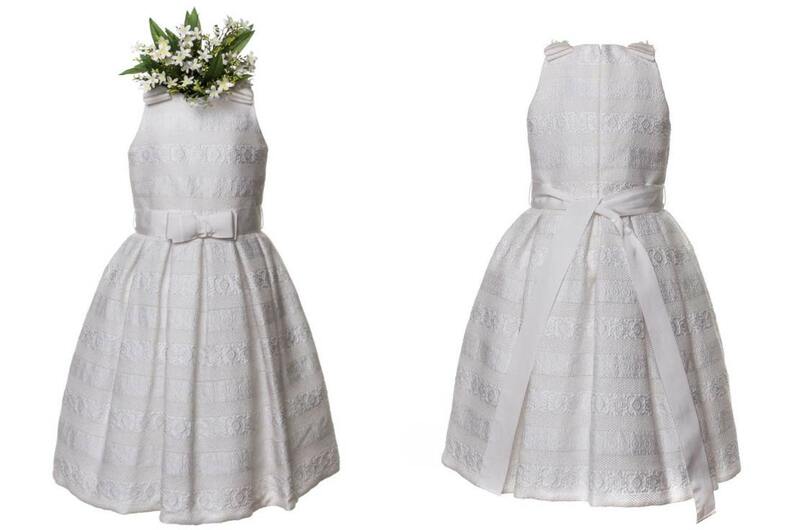 Romanticism, elegance and sobriety contained in the milk white dress with bows, made of brocade fabric perfect for special occasions, like first communion, flower girl and exclusive parties. A model with a classic cut, sleeveless, wide skirt and light folds at the waist that give volume and movement. This dress signed Raffaella is available only in sizes 75 (9/10 years) and 80 (10/11 years) . One of our “best sellers” is certainly the Yvette dress in soft cotton voile. A light, refined, almost impalpable dress, with a perfect and comfortable fit. Classic half sleeve cut with wide skirt, round neckline. 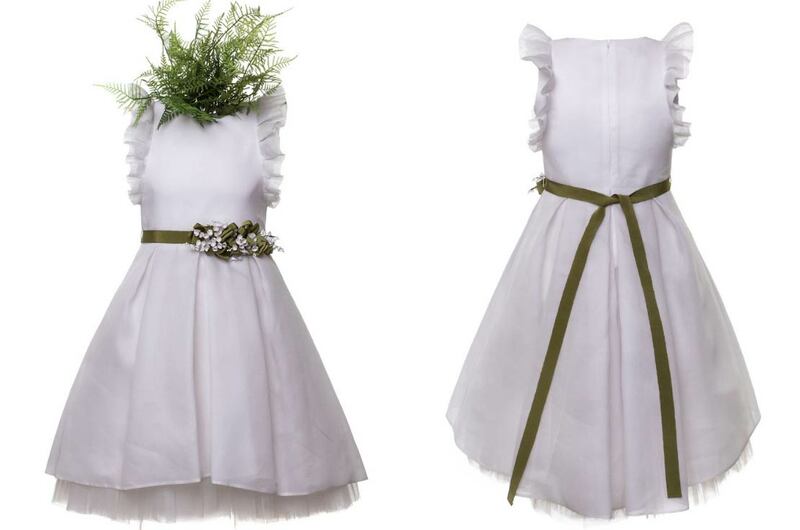 The organza bows on the front and back give the garment the typical charm of childhood. This beautiful dress is currently available only in size 80 (10/11 years). A proposal that combines tradition and modernity, the beautiful Colette stretch tulle dress designed by Raffaella. A sleeveless model with a wide skirt characterized by asymmetrical lengths that give the dress a contemporary character. Elegant bow on the back, refined bodice with a moiré effect, embellished with inlays of woven tulle fabric, embroidered with stones and pearls. 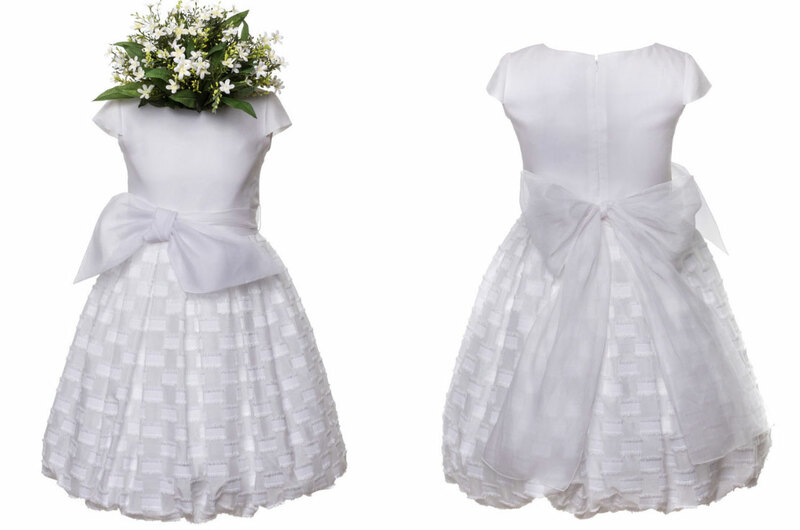 The Colette formal dress is currently only available in size 80 (10/11 years) . 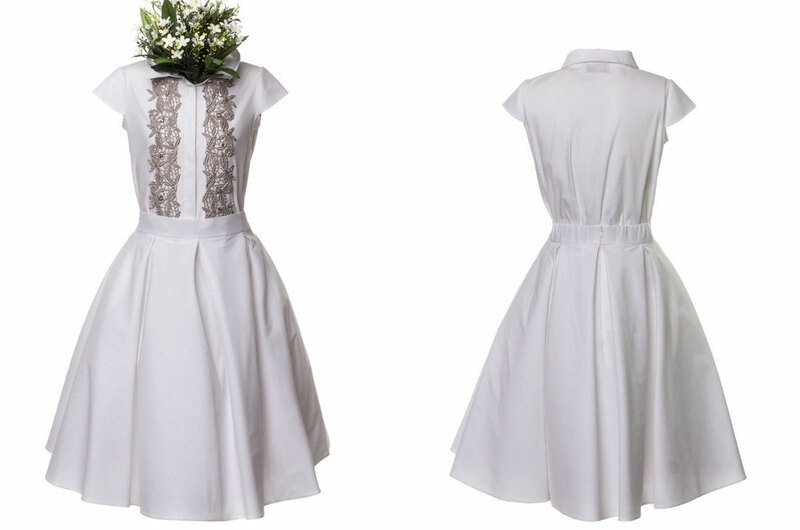 A classic dress, enhanced by romantic notes of craftsmanship is the Via Veneto model by Raffaella. Made of white Swiss cotton organza, a timeless model with a classic cut but updated by the asymmetric play of the wide pleated skirt. The belt of lilies of the valley, handmade, embellishes this piece making it irresistibly romantic. The Via Veneto ceremony dress is currently only available in size 80 (10/11 years) . A current solution is the two-piece suit men’s shirt and skirt; an ideal garment to amaze with refinement and elegance. The shirt is embellished with a platinum macramé work, made by a historic Italian embroiderer, and Swarovski crystals. The round skirt, also made by hand, guarantees the right volume and harmony in full. The two-piece suit is currently available only in size 85 (11/12 years). Do not forget that each dress can be customized with exclusive footwear and accessories. Our staff is available to collect any need for customization. One of the strengths of the Anna Meglio boutiques is the “Tailor Made” proposal (tailor-made clothing creations): we create clothes of extraordinary beauty that are perfectly adapted to the needs of your child. Contact Customer Service at 3711331620; our staff is always at your disposal, even for a free consultation. 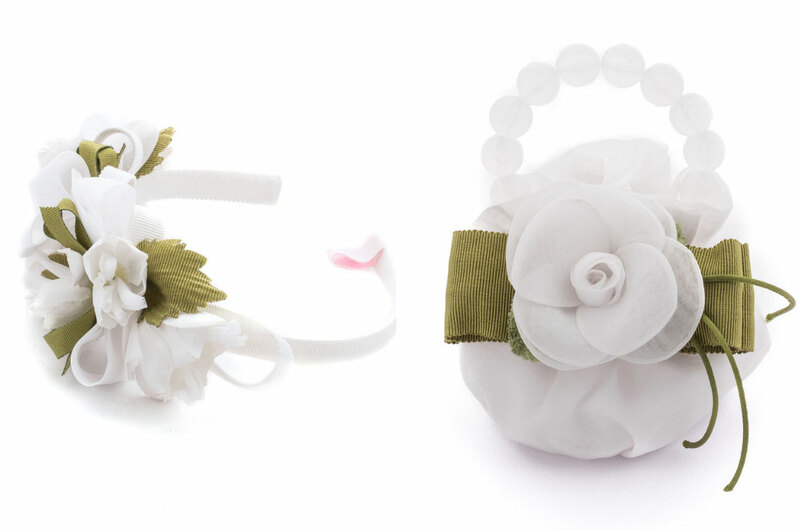 Appointment to the next news dedicated to proposals for baby and child ceremonies!